British forces retake St. Julien and positions on Infantry Hill. Major Cyril Farmer DSO (Royal Garrison Artillery attached Royal Field Artillery) is killed in action at age 33. He is the son of the late Reverend C H Farmer. Major John De Havilland Chisholm-Batten (Royal Field Artillery) is killed at age 28. His brother was killed in September 1915. Captain William Popkiss Stidston (Leinster Regiment) dies of wounds at age 33. He is the son of the late Reverend Samuel Stidston Vicar of Shaugh Prior. Second Lieutenant Henry St John Saunders-Jones (Punjabis) is killed in Dar es Salaam at age 22. He is the son of the Reverend David Saunders-Jones. Second Lieutenant Roger Paul Hepburn (Royal Engineers) dies of wounds at age 24. He is the son of ‘Sir’ Thomas Henry and Lady Hepburn. 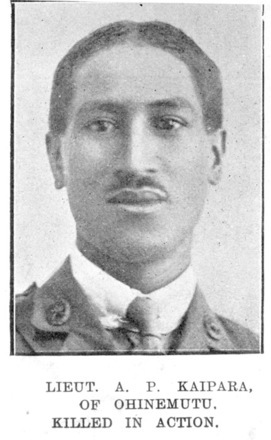 Second Lieutenant Autini Pitara Kaipara (New Zealand Pioneers) is killed at 30 during the wiring of the posts in from of La Basseville when he is struck by a piece of shell while assisting to carry his wounded batman Nikora Te Tuhi into a sap. Te Tuhi will die wounds tomorrow. Kaipara is Captain of North Island and a New Zealand Maori Rugby player. Sergeant Frank William Jestico (Sussex Regiment) is killed. His brother was killed in May 1915. Sergeant James Brebner (Royal Field Artillery) dies of wounds at age 28. His brother will be killed serving on HMS Viking in a collision in February 1918. Private Robert Hunt (West Surrey Regiment) is killed in action at age 28. His brother was killed in July 1916. Private James Everett Sharples (Border Regiment) is killed at age 26. His brother will be killed in May 1918. Private Francis Henry Dixon (Berkshire Regiment) dies of wounds at age 20. His brother will die as a prisoner of war in June next year. Private Richard Harney (Royal Fusiliers) is killed in action. His brother will be killed in October.